Do you have questions? Check out our frequently asked questions here for you to be guided. BRC is approved, bonded and licensed by the Department of Public Health of the State of Illinois. We are always compliant with the specific rules and regulations required by the state when it comes to home care provision. You may also visit our Services page for the complete list of services we offer. What can we expect from you as a home care provider? Have someone you can trust to provide you with care in your personal residence. 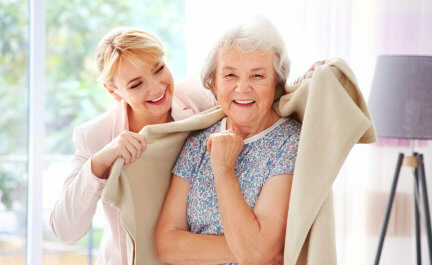 We help you feel comfortable and at peace in your home despite the pains of old age or illness. Apart from being skilled in home care techniques, our staff at BRC are honest, considerate and patient. Our hiring policies ensure that you will be matched with a highly qualified caregiver to provide you with home care services. In view of a customized home care plan, we draw from our experience and expertise to deliver a level of service that adapts to your health and living situation. How can I contact your agency? You can call us at 847-674-2388 and 708-620-9595 or email brcaccesscare@yahoo.com. Where is your agency currently located? What is home care assistance? Home care assistance can be best described as assistance with activities of daily living, the regular things that a healthy person would do for him/herself on a day by day basis. This would include personal care (bathing, dressing, and help with the bathroom), light housekeeping, laundry, linen changes, meal preparation, transportation, running errands and medication reminders. It also consists of things like supervision and companionship. Who can receive home care assistance? Persons of all ages and with a range of personal care needs can get in home care assistance services. If you think that you or a loved one may benefit from home care, we are only a phone call away. A member of our knowledgeable staff can meet for a complimentary in-home evaluation to determine if in home care assistance is right for you. Do you provide home care assistance for someone in an assisted living facility? Yes, we do. We first arrange a meeting with the family to perform a comprehensive assessment and develop a plan of care. This is not only to fully understand what activities you would like to have completed for your loved one, but also to get a sense of what kind of personality might best go well with him or her. After this is completed, we will match the person with a caregiver. If at any time you would like to change your caregiver, this can easily be arranged. Will we get the same caregiver each time care is scheduled? It generally depends on the amount of service you need. If you require considerable hours or 24-hour care, it is only practical to have more than one caregiver coming on a shift basis. But we will certainly do our best for permanence with the staff that is providing the elder care, especially when effort has been made to match the right personalities and care needs. The caregivers like it that way, too. Due to the nature of personal home care assistance, especially with bathing and close physical contact, familiarity and routines make the whole thing much more comfortable for the elderly person getting care. How will you find the right caregiver for our loved one? During the evaluation period, we take note about your loved one’s needs, interests, and hobbies. Then we review our Caregivers database to find the right person that matches the needs of your loved ones. A member of our team will be present also during the first day of the caregiver for introduction and to ensure a smooth start. Can Caregivers help in medication? When provided with a schedule, our caregivers can remind their clients to take their medication, but they cannot manage the medication. What can I expect in a typical day with my caregiver? It depends on the type of service you have requested. It might include personal care (bathing, dressing, and help with the bathroom), light housekeeping, laundry, linen changes, meal preparation, transportation, running errands and medication reminders. It also consists of things like supervision and companionship. Going for a walk or going to the park and playing games. What will happen if our caregiver has an emergency and can’t come that day? During the days when your caregiver is unavailable, we will do our best to find a substitute who will take care of your loved one. We will notify you about the situation, and if you haven’t met the substitute caregiver, a member of our team will come to your home to make introductions. What are the services that you provide? These are the list of services that we provide. Please contact our office to find out more. Who will I contact if I have questions or problems? If you have questions, don’t hesitate to call us in our office and our team member will be happy to assist you. Yes. We provide in service training to all our caregivers. What if I don’t like my caregiver? If you or your loved one is uncomfortable with the caregiver, please let us know right away so we could arrange a replacement until we found the right match. How quickly can service start? We respond in less than 24 hours of notice. Can I make changes to the schedule if I have an appointment? Yes. We ask you to inform us as soon as possible by calling our office or inform the caregiver directly. What happens if our loved one goes to the hospital? The caregiver could come with your loved one in the hospital or pay 50% of the daily rate in order to keep the same caregiver when your loved one comes home. Do I have to sign a contract or keep services for a specified period of time? Yes. You will sign an agreement that we are the agency who is going to take care of your loved one. There is no specific period of time but as long as you needed our services we will be there for you. How often are we billed, and is there a deposit? We will send you the Invoice every 15th and 30th of the month. Our agency does not require a deposit for our services. You pay us as we render our services to your loved one. How does your agency select its caregivers? All our caregivers passes a strict screening, background check and driving check. After all the papers and information are gathered, the caregiver’s name is going to be included in our data base for future placement. What are caregivers not allowed to do? Caregivers cannot do something that would be described as medical or invasive. Most significantly, they cannot manage any medications. If the client requires insulin, or other injections, they would have to be administered by the client, a trusted member of the family or a Nurse from home health agency. No. You should not pay a caregiver directly. You will receive an invoice every other week thru mail or email and you can pay us by check or credit card.